I first met Robert Lucy as co-creator (with his longtime partner Chris Wells) of The Secret City, their stupendous monthly celebration of secular artistic mindfulness, with the apt tagline, “We Worship Art.” I instantly became a huge fan and started volunteering my time to the organization. And I also learned that Lucy not only has great taste in art (he curates and presents the visual artist at every “service”) but he himself is a sought-after fine artist and portraitist. As reproductions of his paintings make very clear in our Ideablog posts this week, Lucy is enormously gifted at capturing likenesses of animals (and human animals) that evoke smiles and deep identification—while also turning them into glorious pop-icons. What’s also outstanding is his ability to convey the monumental emotional significance that these animals have to their commissioning humans—no matter if they are actually teacup creatures off the canvas. We invited Lucy to contribute to our “Dog & Pony Shows” theme, because we think he “puts on the dog” better than any artist we have seen. I’ve been making paintings my entire adult life and have made all kinds of work: Still Lifes, Landscapes, Portraits, Fantastic Fantasies and more. So when it comes to my portrait commissions, I am very open to a client’s requests. An abstract background? Yes. A landscape? Yes. My pet boa constrictor in space? Yes. I am open to receive! After I’d been doing animals for a year or so someone asked me to paint them with their animal. That’s when the fun really began. People often ask, what is harder to paint, a person or an animal? The answer is… a person. When we look at ourselves or another person, the ego tends to get involved: Is my/their nose too big or small? Do I look fat? We look at ourselves and others with scrutiny and judgment. One of the marvelous things about painting animals is that they inspire such unconditional love—in the owner, the viewer and, yes, in me, too. Painting animals and humans together, then, can be a revelation. It’s often said, if you want to know someone, learn what they love. Seeing people with their pets brings out the best in them. 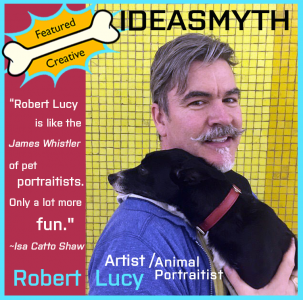 ~~~Robert Lucy has been painting and drawing professionally for over 25 years, and loving animals for my whole life. He has a B.F.A. and an M.F.A. from The School of the Art Institute of Chicago where he lived for 15 years and made a reputation for himself painting still lifes, landscapes, portraits and colored pencil drawings. He grew up in St. Louis, and after leaving Chicago spent several years on the Oregon Coast. In 2006 he moved to NYC, and most recently has moved his home and studio to Woodstock, NY in the Catskill Mountains. 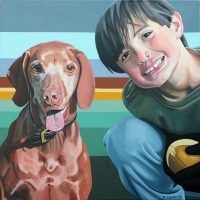 Posted in Branding Ideas, Dog & Pony Shows, Exhibit Ideas, Featured Creatives, Good Ideas, Inspiration and tagged art, dog & pony shows, Featured Creative, painting, pet portraits, Robert Lucy.